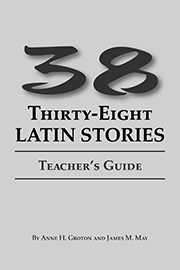 This Teacher's Guide to Thirty-Eight Latin Stories provides a literal translation answer key for all of the stories found in the popular reader. The Guide was developed in response to frequent requests from teachers, homeschoolers, and people who are learning Latin on their own. The translations are not meant to be artistic or literary, but instead straighforward keys to the stories. They are as literal as possible, without being awkward or stilted.